Welcome to your new home for health. 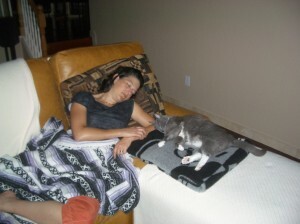 2009 – Sleeping on the couch with our cat. Typical. When you love yourself you enjoy alone time. Personal time is important to help you recharge. You need to have a good relationship with yourself before you can expect to have a good relationship with another person. 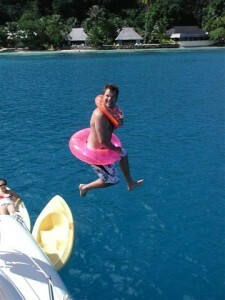 2006 – Greg jumping off the sailboat in Tahiti. I would not be where I am today without my wonderful husband. I am so blessed to have Greg in my life. I believe I am better having Greg in my life. He helps make me who I am. As my mentor says, I don’t have Greg in my life because I need him in my life; he is in my life because I want him in my life. He supports me. He is patient and understanding. He challenges me. He is adventurous and adaptable. He cries with me. He is smart and funny. He laughs with me. He is supportive. Yep, already said that. Surround yourself with people you want in your life, that support you, challenge you, and lift you up. 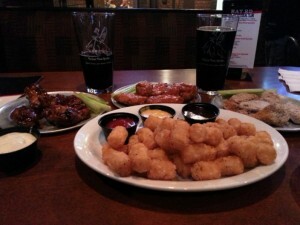 There is a funny story about this dinner. Ask me about it sometime. Yes, I love food. I live by my own diet I call the Michele Spear Lifestyle Diet. While it incorporates more than food, food is a big part of it. I live my diet using the 80/20 rule – I follow it 80% of the time and allow flexibility 20% of the time. This works for me. I also allow more flexibility when it makes sense. For instance, when we go on vacation, the 80/20 rule shifts and we enjoy the food and culture of the location we are visiting. We like variety when it comes to food. A Group Cooking Class can help you incorporate more variety into your diet. 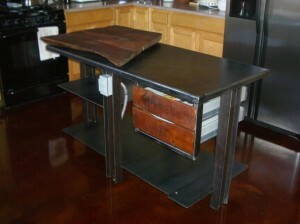 Our custom kitchen island with a large butchers block. My mom can’t believe she is reading this. I think she thought I would enjoy cooking since I loved my Easy Bake Oven as a child. She asked me to help cook as a teenager and I did not want anything to do with it. When I moved out on my own, and especially as I started to eat healthier, cooking myself became more important. I really love time in the kitchen now. You don’t need to love kitchen time. Not everyone does or ever will. I believe you should enjoy it enough to create your dishes with love. I also believe the right kitchen “tools” helps. Check out Kitchen Tools I Love for information about helpful kitchen tools. 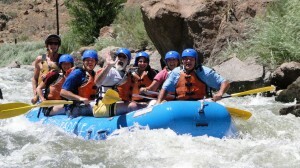 2007 – White water rafting on the Arkansas River in Colorado. My love for food requires me to be active. Fortunately, I really enjoy exercise (the dreaded “E” word). I do activities I enjoy and adjust based on what I want that day. For instance, I have been going to the gym for 14+ years. A few years ago I didn’t feel like doing the gym, so I didn’t…for six months. Instead, I did other activities and when it felt right, I went back to the gym. Look for opportunities to add enjoyable activity into your day. 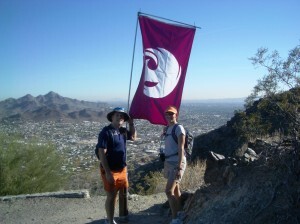 2006 – The top of N Mountain, summit #7, of the Phoenix Summit Challenge. My relationship with hiking is a love-hate one, although mostly love. The “hate” comes from an IT Band injury during a 2007 Grand Canyon hike and I am still dealing with ITBS. Even with that, I still love to hike and do so at least weekly. My hiking distance has adjusted due to this injury. There are two things I love about hiking. One is that you can go places you can only get to by hiking. Paria Canyon is a great example. The second thing is that hiking is great personal time for me. I am not a person that listens to music while hiking. It is me and nature. I think a lot. Where and how do you find time to think? Prepared to teach my first yoga class. In 2006 Greg and I did a workshop about values and vision. We did an exercise writing about our ideal day where I hiked, cooked healthy meals, and practiced yoga. Actually, I owned the yoga studio (maybe someday). 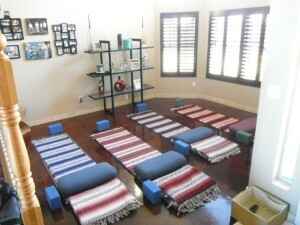 I enjoy a wide variety of yoga – Bikram, Vinyasa, Yin, Levels 1, 1-2, 2, Yin/Yang, Restorative; heated and non-heated. I choose what my mind and body wants that day. I am grateful for the opportunity to explore yoga with you. If you previously tried yoga and didn’t like it, maybe it is time to try again; you are bound to find a style that is a fit for you. Whether I am researching or reading a book to expand my knowledge, coaching, or testing a new diet, I truly enjoy being here to support you. I know there are a lot of coaches to choose from. You will know the right coach when you find him or her. I am not an expert in all things. I know what I know because of my journey (see My Story). Maybe there are some similarities to your journey; maybe there aren’t, yet you feel a connection with me and believe we should work together.